Since its inception, one of the key components of RAS' product line was virtual emulations of vintage analog synthesizers. In honor of that history, all five of the RAS Vintage collection are available for download in one package, free of charge just as it was from day one. RA Mowg is an emulation of a Moog Minimoog Model D. Another addition to the line-up of Roberson Audio's collection of vintage replica synths, many many months have been spent to create an instrument that not only resembles the Minimoog in appearance, but delivers the same feel while playing. From the deep, full-bodied filters, to the mellow analog-style oscillators, to the distortive drive from feedback-looping the output, this instrument can give you the feeling of playing a Minimoog without spending a small fortune to do so. 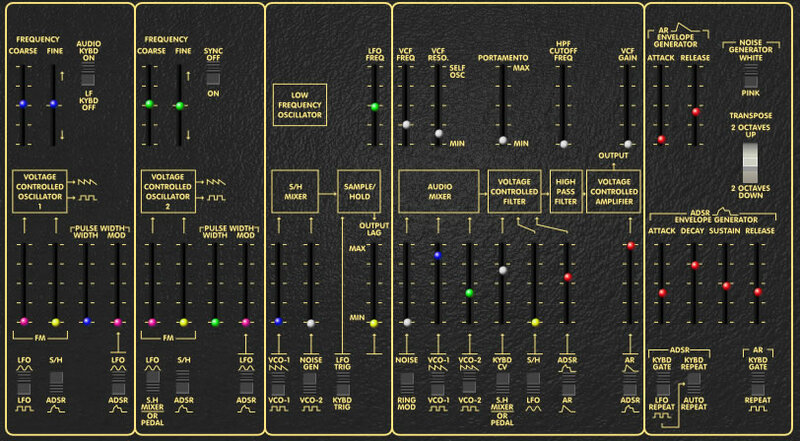 Oddy-Free is an emulation of an Arp Odyssey Mk.II - much attention to detail was given in the layout of the signal path to have it behave as accurately as possible. It does have just a touch more umph than most originals would - this particular emulation was based on the "illegal" filter versions based on Moog's -24dB Low-Pass filter, so it sounds quite a bit smoother and richer but at the same it can produce the harsh metallic tones known from the Odyssey. Prophanity is an emulation of a Sequential Circuits Prophet 5. Much time was given for attention to detail in nearly every aspect of the instrument, and most every subtlety has been accounted for. The Mini-Vyn is an original virtual analog/subtractive design, entered as a competition piece for KVR Audio's Developer Competition circa 2006. With the ability to be monophonic as well as polyphonic (and possessing a slightly different tonal quality between the modes), the Mini-Vyn is also an incredibly flexible "bread-and-butter" VA. To set it truly apart, the instrument has a feedback-overdrive circuit of original Roberson Audio design that gives the filter a rich and organic sound when pushed to the extreme. 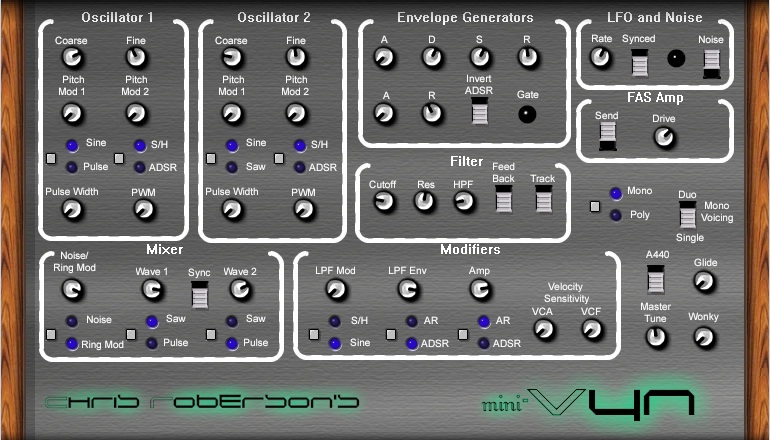 TerVoxSyn is Roberson Audio Synthesizer's very own Theremin emulation. A very special filter model was designed to accurately capture the voice-like sound of a true tube-type Theremin.